While most of the ink spent on debating valuation methodology in shipping is about the (coarse and fine) differences among the three primary valuation methods (please see previous note on our blog), no much attention is paid on the finer points of the Fair Market Approach (FMV). The FMV is the method used by default in loan agreements, and it’s supposed to be the only ‘real’ valuation method, as it reflects the price the market will pay for the asset, fair and square. Finding a price of a 20 Oz. bottle of Coca Cola is very easy; one can do this by just walking in the closest convenience or grocery store and the price is posted right there for all to see. One doesn’t even have to enter into a transaction to discover the price. Probably a store close-by will have a very similar price, again posted for comparison. An upscale store or a store in an expensive neighborhood can be expected to have a higher price, and if one can wait till the weekend to buy in bulk at Costco, the price would be meaningfully discounted. There is a great deal of market transparency, which has become even more effective in the age of the internet and smartphones; there are even apps that allow for instant price checking while shopping. Only if the waters were so clear for price checking in shipping! A lot of the sale & purchase deals are bilateral and they may involve a broker (or a couple of brokers), thus only a handful number of parties know the intimate details of the transaction and the pricing. Maybe the second-best buyer (and their broker) suspect the real price (i.e they know they offered $X for the vessel, and they lost, so the actual price logically has to be at least $X+1); again, this is only a suspicion and again it’s based on the assumption that buyer and seller are rational (or it was an arm’s length transaction; however, precious little prohibits from the sale taking place at $X-1, but that may be found under the ‘agency theory’.) So, two or three parties really know the fine pricing point where title of ownership took place, and these parties perhaps do not have interest to divulge the exact details to the market for many reasons, ranging from privacy to protecting a competitive advantage. Thus, what is reported in the market (usually by way of broker reports) is not necessarily accurate, for legitimate or bad reasons; our background in sale & purchase confirms such point; a great deal of the reports of deals we were involved with were misrepresented to a certain extent, once or twice misreported to the extent of ignorance. Then, besides the price, we have to deal with the subject market itself: we all can agree that a 12 Oz. bottle of Coca Cola is a very standardized ‘commodity’ in a certain geographic market, from content, to packaging, to labeling, etc However, what is a ship? It’s more than a philosophical or a poetic question than ‘what’s in a name?’ Even vessels built on the same design cannot necessarily be exact copies; some got more TLC from their owners during construction in terms of attention to detail and good craftsmanship and also more attention after their delivery. We do not mean necessarily vessels built on same design from different yards, but vessels built on same design by the same yard and have subsequent hull numbering. It has been known that many young yards (some of them ‘greenfield’ yards) were building vessels fast enough to just stay afloat for the next year. Yes, there is price differentiation between vessels coming from good and bad yards, good and bad owners, etc but again, the fine detail of specification, design and maintenance of the vessel is not widely known. In a market where even the name of the manufacturer is not much of solace for quality consistency ‘that which we call a modern bulker, by any other name would rust as fast,’ if we were to take the poetic liberty to have Juliet get involved in shipping. And of course, there is the point of the owner and vessel manager, where the standards of maintenance and spare parts onboard differentiate the ‘stable’ vessels come from. You see, certain managers take at face value the old saying that vessels are referred to as ‘she’ because like women demand constant attention; and, the more the attention they attract, the better their standing in their social circle (market place). It’s not a 20 Oz. Coca Cola bottle situation here, comparing apples to apples. Vessels are required to be drydocked every five or two-and-a-half years at a cost that can range in the million dollar range. In today’s market, consideration is given on pricing for the vessel’s ‘survey position’, that is when the vessel is drydock due. However, an owner intending to sell the vessel right after her drydock, they may opt for the ‘lipstick on a pig’ treatment rather than more fundamental maintenance; and, a serious buyer may opt for a vessel purchase pre-drydock in order to have the opportunity for a thorough preventive maintenance schedule at a much higher cost. In short, the ‘survey position’ adjustment can be opaque (one ‘had to be there’ to know for sure) or can be completely subjective based on the buyer’s trading and maintenance standards, and optimal points of competence and convenience. Another consideration on the fair market value goes back to the gross and net price of the vessel; there are commissions that can make a big difference on the pricing; it could be that there are several brokers involved, or that there is a hefty ‘address commission’ where effectively the buyer or the seller or both are subsidizing their in-house brokerage business by adding another commission. There is a sizeable difference on the pricing of a vessel if the commission is just the ‘standard’ 1% or 5% including ‘address commission’ but market reports refer to the ‘gross’ number. How about the location of the delivery of the vessel to her new buyer? A vessel delivered close to a loading port when she can immediately start earning freight revenue is a much more preferable location than a delivery closer to the discharge port. For smaller vessels in the dry bulk market, the difference between ‘loading’ and ‘discharge’ ports may be as convenient as shifting the vessel from one berth to another in the same harbor; however, for bigger vessels like supertankers or capesize vessels, the ‘loading’ and the ‘discharge’ ports can be half-a-world apart (like Middle East and US Gulf Coast for VLCCs, or Brazil and China for capesize vessels); at today’s bunker pricing, repositioning a vessel on one of these trades can be one to two million dollars; plus, their is the operational expense to reposition the vessel to the new loading port. According to NSF template (Norwegian Sale Form), it’s the seller that determines the actual delivery location of the vessel, but within a range of ports mutually pre-agreed between seller and buyer. So, two identical vessels (with our point above notwithstanding on exact duplicates) that are sold at two different locations could be apart a few million dollars; but when vessel sales are reported, location delivery is always ignored. There is a standard definition for fair market value about willing seller and willing buyer, etc where market comparable valuations are based; the standard valuation methodology in shipping does not require an objective, physical inspection of the vessel, and also, as an industry practice, vessels of same size and design are assumed duplicates for valuation purposes. The fair market valuation methodology has often been ‘abused’ in our opinion; here, we went tangentially about a few of the points that routinely are ignored on the pricing and determining what’s really the market price; and, we have focused here on market transparency solely, and we have not touched at all the situation when the buyer or the seller, while both ‘willing’, can exert disproportionally more pressure on the other side and command higher control of the transaction and its outcome. In providing vessel valuations, ship appraisals and marine surveys, our firm Karatzas Marine Advisors & Co employs Accredited Senior Appraisers (ASA) by the American Society of Appraisers for Machinery and Technical Specialties, among their many qualifications. This entry was posted in Vessel Valuations & Appraisals and tagged address commission, Basil M Karatzas, drydock, fair market value, Karatzas Marine Advisors & Co., survey position on September 5, 2013 by Karatzas Marine Advisors & Co.. In a previous posting, we briefly discussed the three main valuation methods, namely the market comparable approach, the replacement cost approach and the income approach. Given the illiquidity of and the dislocations in the shipping markets since 2008, there is no wonder that some people may think that the present market is just too ‘depressed’ to be considered an active market. Vessel valuations is not just a ‘theoretical exercise’, one of the many boxes to be checked in a loan agreement; they can have severe implications for the shipowners and their lenders themselves, given the banking crises post-Lehman-Bros-collapse. Under that prism, the Hamburg Shipbrokers Association (HVSS) suggested a formula to be utilized for valuations (Financial Times article, October 25, 2009); it’s based on the income approach, and it presumes that vessels – read modern vessels owned by KG funds and financed by German banks – have value in the long-term, no matter how inefficient or dislocated the present market is. The so-called ‘Long Term Asset Value’ model (LTAV), also known as the ‘Hamburg Ship Valuation Standard’ (HSVS), or in short the ‘Hamburg Rules Method’, looks at the earning potential of the vessel over their remaining economic life, no matter how bleak the present situation is. In short, the ‘Hamburg Rules’ presume that vessels are getting scrapped at the end of their design life (usually twenty-five years) and that have the same earnings potential throughout their design life; as a rule of thumb, estimates for future earnings can accurately be reflected by the average earnings of the last ten years. As far as the discount rate is concerned, it’s only a few short hundred basis points above LIBOR, especially for containerships that are chartered under long-term charters. 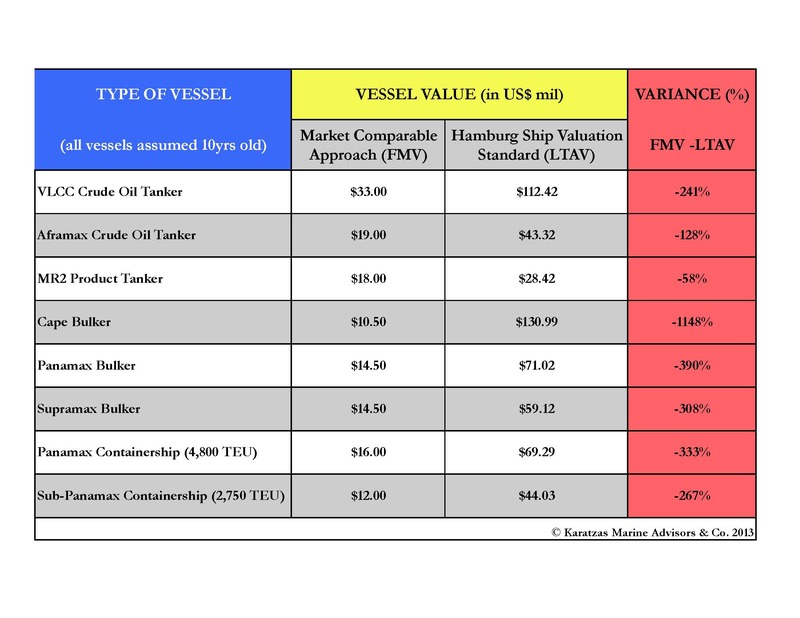 From data provided by Karatzas Marine Advisors & Co., a Manhattan-based shipping finance advisory, vessel valuations and ship brokerage firm, the following table was prepared for mainstream asset classes in the crude oil and petroleum product tanker markets, dry bulk markets, and small containership vessels market. The calculations are based on 5% discount rate (in line with the HVSS suggested rate – no debate on the accuracy of the rate from us), and future earnings for the vessels over the fifteen remaining years of their economic life are based on the average earnings of the last ten years (again, in line with the suggested HVSS suggested rate – but, one has to consider that the last ten years do incorporate an once-if-a-life time supercycle of earnings). It’s clear that the Hamburg Ship Valuation Standard provides for ‘generous’ valuations, at least for now and at least for ten-year old vessels. The least ‘generous’ valuation is for MR2 product tankers with a 60% premium over the market comparable approach (the result of the product tanker market being ‘hot’ over the last few years), while the most ‘generous’ valuation has been for capesize dry bulk vessels (a premium of almost 1100%, no doubt due to the ‘red hot’ freight market for capes prior to 2008; again, ‘Hamburg Rules’ presume that the past is sufficient to predict the future, or, at very least, the most recent ten past years). Germany’s investment code (Kapitalanlagegesetzbuch or KAGB) has recently been amended to allow for vessel valuations based on the ‘Hamburg Rules’. The accounting firm PriceWaterhouseCoopers (PwC) has attested that the ‘HSVS method is in full compliance with auditing standards for the valuation of an ongoing concern.’ The Verband Deutscher Reeder (VDR) – the German Shipowners Association, and the Zentralverband Deutscher Schiffsmakler (ZDS) – the German Shipbrokers Association, have welcomed the news of incorporating the HSVS methodology to KAGB. © Basil M Karatzas 2013 – 2014 All Rights Reserved. This entry was posted in Vessel Valuations & Appraisals and tagged Basil M Karatzas, Hamburg Ship Valuation Standard, income approach valuation, Karatzas Marine Advisors & Co., Long Term Asset Value, VDR, vessel valuations on August 9, 2013 by Karatzas Marine Advisors & Co.. In an article published a few years ago in the Tanker Operator, a well-respected trade publication about the tanker market, we had discussed the three primary methods of vessel valuations: a) the market comparable approach, also known as ‘last done’ in shipping, b) the replacement cost method, and c) the income approach. Each of these three methods has its advantages but also shortcomings, and each method may be better suited under certain circumstances. The market comparable approach reflects what the market will pay for an asset in nakedly materialistic, ‘cold money’; this approach is the default method for vessel valuations in standard loan agreements, but it’s also an approach susceptible to the ‘animal spirits’ of the markets, opaqueness, illiquidity, market dislocations, and all. The replacement cost method has been burdened by its backward-looking mentality and dependence on ‘historical cost’, and thus this approach has been limited to valuing unique, customized and non-mainstream assets. The income approach ought to be the preferred way of valuing vessels (and all sort of investments) since it depends on expected earnings during the asset’s remaining economic life. However, as ‘fundamental’ or ‘intrinsic’ this way of valuing assets may be, the devil is in the details, as they say; since expectations for future earnings can vary widely based on many factors, including the ability to generate them – a more competent investor (buyer) can generate more profits than a poor performer, and also the cost of capital – better capitalized investors (buyers) have a more effective capital structure with lower costs, the income approach valuation methodology can lead to a wide-ranging values. In the hands of a scrupulous valuator, the income approach may be just a weapon of ‘mass destruction’ to work ‘backwards’ and generate any price for the price of the asset; just presume future earnings trends and justify a low discount rate, and voilá, the price can appear out of thin air. There have been ‘variations on the theme’ for the income approach, such as Discounted Cash Flows (DCF), Net Present Value (NPV), etc. An income approach variation unique to shipping has been the method suggested by the Hamburg Shipbrokers Association (HVSS) three years ago and has been known as the Long Term Asset Valuation method (LTAV), also known as Hamburg Ship Valuation Standard (HSVS), also colloquially known as the ‘Hamburg Rules’ of vessel valuations. It has widely been debated whether the ‘Hamburg Rules’ is a proper valuation methodology since the formula inputs for future earnings are ‘backward looking’ dependent on the ‘past performance’ of the last ten years (including the years of the unique super-cycle of freight earnings) will be achievable going forward (as proxy of future earnings, the average of freights for the last ten years is inputted.) Likewise, the discount rate suggested by the Hamburg Rules has been debated that could only be achieved by exceptionally well-capitalized companies at times that the finance cost is historically too low. But again, when the market is so illiquid and the market comparable approach can only have indicative consequence, a valuator needs all the help they can get in order to value a vessel. For instance, in the last three years, only four VLCCs up-to-four years old have been sold. Not sure that the market comparable approach offers any better guidance on pricing than the ‘Hamburg Rules’ approach. Probably ‘gut feeling’ is a much better approach, although no self-respected valuator or accountant will accept such approach; but again, shipping is a poorly model-able industry. This entry was posted in Vessel Valuations & Appraisals and tagged Basil Karatzas, Basil M Karatzas, Hamburg Ship Valuation Standard, Hamburg Shipbrokers Association, Karatzas Marine Advisors & Co., Long Term Asset Value, shipping finance, valuation, valuation methodology, vessel valuations on August 9, 2013 by Karatzas Marine Advisors & Co..